When the Referential Integrity Plug-in is enabled, it performs integrity updates on specified attributes immediately after a delete or rename operation. By default, the Referential Integrity Plug-in is disabled. The Referential Integrity Plug-in should only be enabled on one supplier replica in a multi-master replication environment to avoid conflict resolution loops. When enabling the plug-in on servers issuing chaining requests, be sure to analyze performance resource and time needs, as well as your integrity needs. Integrity checks can be time-consuming and draining on memory and CPU. Record referential integrity updates in the replication changelog. All attributes used in referential integrity must be indexed for presence, equality, and subtring; not indexing those attributes results poor server performance for modify and delete operations. See Section 9.2, “Creating Standard Indexes” for more information about checking and creating indexes. If the replication environment satisfies the all of those condition, you can enable the Referential Integrity Plug-in. 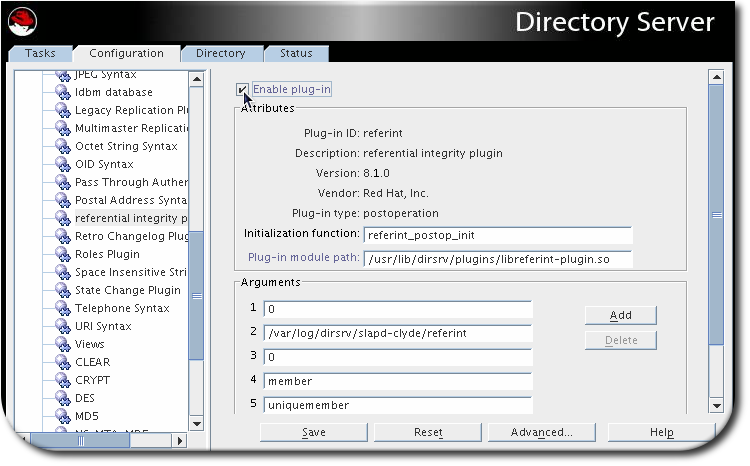 Enable the Referential Integrity Plug-in as described in Section 3.6.3, “Enabling and Disabling Referential Integrity”. Ensure that the Referential Integrity Plug-in is disabled on all consumer servers. Because the supplier server sends any changes made by the Referential Integrity Plug-in to consumer servers, it is unnecessary to run the Referential Integrity Plug-in on consumer servers. Select the Configuration tab, and expand the Plugins folder. Select Referential Integrity Postoperation Plug-in from the list. Check the Enable plugin check box to enable the plug-in; clear it to disable it. Fill in the correct path to the plug-in by default; plug-ins are located in /usr/lib64/dirsrv/plugins. Restart the Directory Server to apply the changes. In the Tasks tab, select Restart the Directory Server. Select the Configuration tab, and expand the Plugins folder. Select the Referential Integrity Postoperation Plug-in. In the arguments list, replace the value in the first text box with the appropriate time interval. The first argument listed sets the update interval for referential integrity checks. To change the interval, replace the nsslapd-pluginarg0 attribute. By default, the Referential Integrity Plug-in is set up to check for and update the member, uniquemember, owner, and seeAlso attributes. You can add or delete attributes to be updated through the Directory Server Console, such as adding the nsroledn attribute if roles are being used. Keep in mind that any attribute specified in the Referential Integrity Plug-in parameter list must have equality indexing on all databases. Otherwise, the plug-in scans every entry of the databases for matching the deleted or modified DN, degrading performance severely. If you add an attribute, ensure that it is indexed in all the back ends. Improve the performance by removing any unused attributes from the list. In the Arguments section, use the Add and Delete buttons to modify the attributes in the list. All attributes used in referential integrity must be indexed for presence and equality; not indexing those attributes results poor server performance for modify and delete operations. See Section 9.2, “Creating Standard Indexes” for more information about checking and creating indexes. 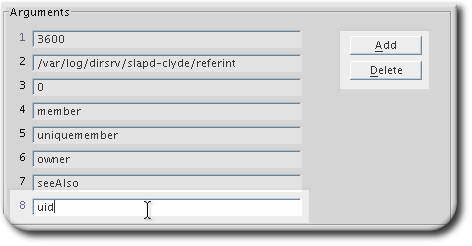 By default, the Referential Integrity plug-in is set up to check for and update the member, uniquemember, owner, and seeAlso attributes. All the configuration attribute settings, for example adding or removing a shared entry, are dynamic and do not require a server restart to take effect. -1: No check for referential integrity is performed. 0: The check for referential integrity is performed immediately. Positive integer value: Represents the interval in seconds for performing the referential integrity check. nsslapd-pluginarg1 Sets the path to the log file. nsslapd-pluginarg[3-10] Sets the attributes on which the plug-in performs integrity updates.